I feel like things changed most in the 1960s, and the pace of change really slowed starting in the 90s — on the social mores front anyway. Technology is another story altogether! Well … I suppose social mores can only evolve so much before society totally breaks down. :D But as you say, tech is another story! We’re privileged to be witnessing a critical turning point in our species’ evolution, I think. Love these commercials! And I especially wouldn’t mind having that slide projector that accepts medium format. I looked. They pop up from time to time on eBay. That had to be a hard transition in Binghamton, especially as GAF stopped manufacturing cameras. My main memory of GAF was that their logo was on the VIew-Master I had as a kid. As a boy without vision challenges that scotched my 3D vision, my View-Master wasn’t that much fun. Yes we did put our “good clothes” on, when going visiting; or even out to dinner. Same thing for going to the movies. We had school clothes, and changed into our play clothes, after we got home. I grew up at the very tail end of the school clothes / play clothes era. Most of my friends did not change into play clothes when they got home, but my brother and I did, and so did a few of our friends. I have to admit that I lean towards the, “My dead presidents are dressed just as nicely as yours”, these days; but not the bottom of the clothes hamper look. I find I shoot more film these days, and enjoyed the old ANSCO commercials immensely. I thought I was reasonably knowledgeable about film, but I’ve never heard of Printon prints, so thanks for that. I only wish I had as much interest in technology that wasn’t obsolete! Right, I’m off to back up some files on to a floppy disk…. 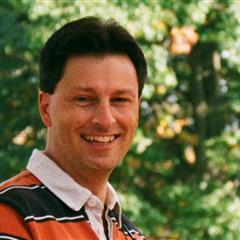 I’d never heard of Printon prints either! I did some Google-fu to learn about the process. That’s how I found the link that I shared. Was Ansco a known brand on your side of the ocean? When I was a young collector in the 70s and 80s, old Ansco cameras were cheap and plentiful. As far as I know we didn’t have Ansco cameras in the UK. I certainly don’t remember any. Kodak was a very popular brand for lower end consumer cameras over here.I remember being very impressed in the late 1970s by a school friend of mine getting a Kodak Ektra camera with a fold out handle. It took 110 film I think and it had been heavily advertised on TV in the run-up to Christmas. In the 70s my Dad had a rangefinder camera of some sorts. I remember because I could never work out how to focus it with that mysterious yellow patch. By the early 80s, as a family we had several cheap 110 fixed focus cameras. Easier to use, but when I look through the family albums now there’s a definite decline in quality from the 70s to the 80s! Cheap 110 cameras were a scourge. I bought one for a trip to Germany in 1984 and shot easily two dozen cartridges, and got a bunch of poor quality images back. I regret to this day not saving up for something better. 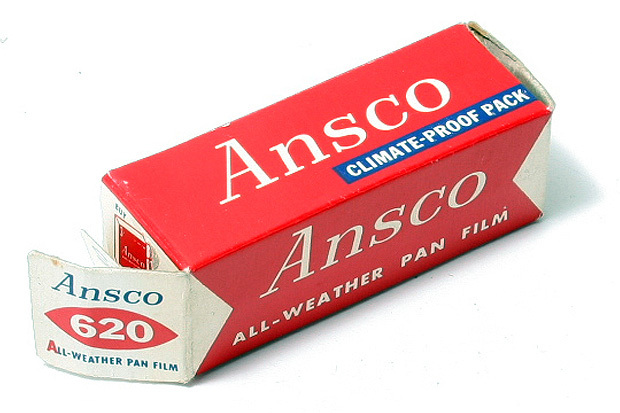 When I started my career, you could still buy Ansco film (advertised on the TV by Henry Fonda no less! ), Of course, real “professionals”, other than wedding photographers, used “chrome” or transparency film for anything needed in color, color negative film was too “soft” and flat, and could be open to interpreting the colors. Anscochrome made a beautiful asa 500 speed transparency film, that was very grainy and pastel like, and you could buy it in 120 as well as 35mm and a few other formats. The photographers I first worked for would use it for dreamy photographs of models for ads. One thing tho, a lot of these E-3. E-4, and E-6 processable films sure faded fast, I shot some Anscochrome in the early 70’s and it was “gone” by the early 80’s! Kodachrome was a different process to everything else, and the colors lasted the longest, but probably next was Ektachrome processed by Kodak (they used to lacquer it! ), then Ektachrome processed by your local “pro” lab. Anscochrome, Agfachrome, Surachrome, Ferraniachrome, and almost anything else, you were lucky if you looked at it a few years later and it wasn’t fading! Fading was such a problem with so many consumer color films, I can see. I’ve heard that original Kodacolor negatives hold up remarkably well. As for slide film, sure seems like shooting anything but Kodachrome back in the day was a waste of money because of the fast fading. I just got a Anscoflex in the mail today. I need to clean it up and put it through it’s paces. Oooh, jealousy! I’ve been eyeing those for years. 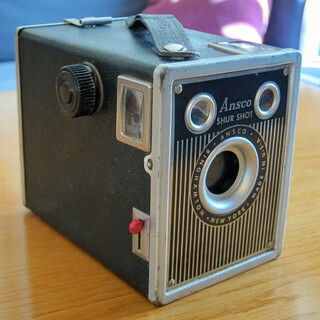 I remember my parents used a Ansco Readyflash when I was very young. I tend to remember GAF better than Ansco. GAF made a 500 ASA slide film back when that seemed incredibly fast for a color film I used it a few times. GAF 500 was very grainy but had a warmth to the color that I liked. When I was young it was still considered necessary to dress up for occasions like going to church or out to eat. I was very happy as a kid when those standards were relaxed. Although that transition did cause some older people much trauma. Lately I have found myself thinking that it would have been nice if we hadn’t dropped the habit of wearing the kind of hats that people used to wear. I suppose that may be the result of thinning hair. Readyflashes are common as pennies on eBay. Like so many 620 cameras, you can hardly give them away now. And I’ve read about that GAF 500 film somewhere — there seemed to be a lot of people who liked it. I’m happy not to have to wear a jacket and tie to go out for dinner. But today, going out for dinner isn’t the special event it was 40 years ago. And I still have my hair — not a fan of hats. Interesting piece of nostalgia. When I look back at my parent’s old slides, yes, everyone seemed dressed up (relatively in today’s standards). And everyone had hats. I believe Haking Enterprice LTD (makers of Halina Cameras) bought the rights to the Ansco name. Hey, wow, thanks for that link Christopher. I used to see Ansco cameras at Walmart and such but not in the last 10 years or so, so I assumed the name finally went away. Apparently not!